Outdoors 720: A moth that looks like a poodle -- it's the real deal! 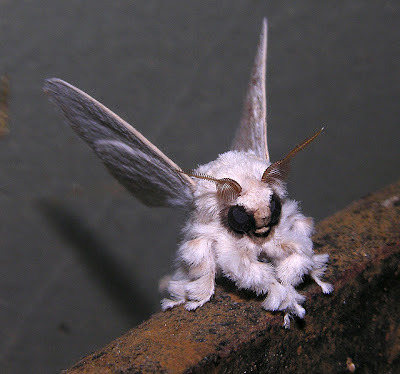 A moth that looks like a poodle -- it's the real deal! If you thought a Photoshopper did one heckuva job turning a moth into a poodle, think again. This photo of the Venezuelan Poodle Moth is the real deal, and it comes from a collection of photos by Dr. Arthur Anker, NUS, in Bishkek, Kyrgyzstan. He has more incredible photos of odd-looking moths that are worth a look at GrindOutdoor. One has a slight resemblance of Lady Gaga.